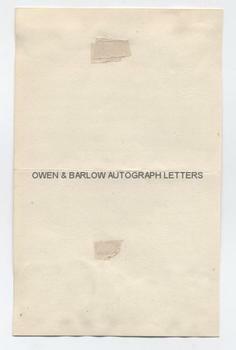 HERBERT KITCHENER Autograph Dispatch Signed. Autograph Dispatch, Signed. 1p. Kaka. 21st October 1899. To Lewis Bey at 'A' Station. The first 9 lines of the dispatch have been censored with black ink but the remainder reads "and instruct the latter to make every enquiry as to the truth or otherwise of this report by sending spies in the direction and obtaining information from natives. It is essential that I should know with the least possible delay what the Khalifa's movements are and you should instruct Dorain to send me immediate news by Camel Corps orderly. Kitchener Sirdar." 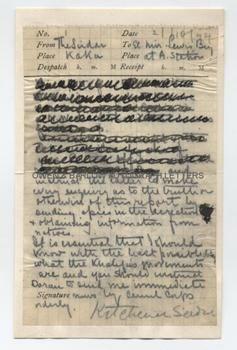 The dispatch is written on British army official issue, thin onion skin paper with printed headings and with horizontal and vertical grid lines. It measures approx 6.4 x 4 inches. It is laid down by its top and bottom edges to an album leaf but is in fine condition. David Francis Lewis (Lewis Bey) was a colonel seconded to the Egyptian Army who fought throughout the Dongola and Nile campaigns in the Mahdist War in the Sudan. He commanded an infantry brigade at the Battle of Umm Dibaikarat on 25th Novemebr1899, in which the Khalifa Abd Allahi was killed. Following the British victory at the Battle of Omdurman in 1898, Kitchener still faced a hard campaign against the three Khalifa's of Muhammad Ahmad (the 'Mahdi'). This dispatch from Kitchener was written in the weeks leading up to the decisive battle when he was anxious to verify the reports received that a strong force of the Khalifa Abdallahi ibn Muhammad's Sudanese were among his native Baggara to the west of Kaka (Kusti). Kitchener sent 8,000 men to intercept them and after a short retreat the Khalifa made his stand with 10,000 men at Umm Dikaikarat (Diwaykarat) where he was killed and a final victory was won by the British.